More than 55 million Turkish citizens will vote Sunday on the April 16 referendum proposing constitutional changes, including giving wide-ranging executive powers to the president. Citizens will go to over 167,000 polling stations nationwide. Over 1 million of them are first-time voters who recently turned 18. Inmates — except for the criminals who are convicted for intentional crime — will also be able to vote at 463 polling stations located inside state prisons. Prisoners, who are jailed and pending trial, and who are convicted for negligent crime, will be able to vote in the referendum. Although the Supreme Election Board has not publicly announced the exact number, according to a story on Turkish national newspaper Milliyet, there are currently 78,894 prisoners who were convicted and would be able to vote, 127 percent more than in the November 1 elections. Sunday’s ballots will have two sides with two different colors, and voters will indicate their choice by voting either Yes on the white side of the paper or No on the brown side. Voters will impress a seal on the side they have chosen. 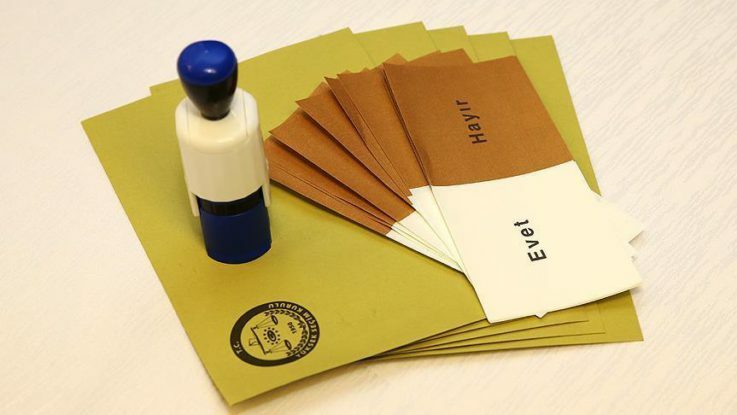 Voters will then place the ballot inside a yellow envelope that has the symbol of the Turkish Republic’s Supreme Election Board on it and cast their ballots. Voting will take place between 7 am and 4 pm in Turkey’s eastern provinces of Adiyaman, Agri, Artvin, Bingol, Bitlis, Diyarbakir, Elazig, Erzincan, Erzurum, Gaziantep, Giresun, Gumushane, Hakkari, Kars, Malatya, Kahramanmaras, Mardin, Mus, Ordu, Rize, Siirt, Sivas, Trabzon, Tunceli, Sanliurfa, Van, Bayburt, Batman, Sirnak, Ardahan, Igdir, and Kilis. For the rest of the country, the ballot boxes will be open between 8 am and 5 pm. The reason for the difference is that the sun rises and sets earlier in the east of the country than in the west. On April 16, the electorate in Turkey will be asked to vote Yes or No to an 18-article reform bill, which would also change the current parliamentary system to a presidential one. The Yes campaign is backed by the ruling Justice and Development (AK) Party and the opposition Nationalist Movement Party (MHP), whereas the main opposition Republican People’s Party (CHP) is in favor of No. The constitutional changes have been discussed since President Recep Tayyip Erdogan was voted president in August 2014. This marked the first time a Turkish president had been directly chosen by popular vote. The 18-article bill was passed by parliament in January, with 339 votes in favor — nine more than needed to put the proposal to a referendum. The reforms would extend the president’s executive powers and the president would also be allowed to retain ties to a political party. Simultaneous parliamentary and presidential elections for a five-year term would be held in November 2019 under the new constitution. Approximately 2.9 million Turkish expatriates have already voted on the referendum between March 27 and April 9. This referendum is their fourth trip to the polls since expatriates were permitted to vote in Turkish elections while overseas. The country’s current constitution was formed in 1983 following a military coup in 1980.